The rainy season invites many pesky insects which are harmful for your toddler. These insect bites results in redness, swelling and irritation and causes a great deal of worries for you. Tropical climate like that of India’s, invites a lot of insects especially mosquitoes and flies in rainy weather. This makes it is impossible to avoid being bit by mosquitoes. However, you can minimize the insect bites to a great extent by taking certain measures. The primary measure needs you to check the hygiene standards inside and outside your house. The insects especially flies and mosquitoes get attracted to dirt, dampness and filth around, so you need to maintain neatness everywhere. It is surely needed to check that your child stays protected from mosquitoes and insects as they spread some serious diseases. 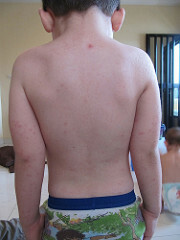 Mosquito bites can cause dengue, chicken guinea, malaria and encephalitis. The best part is that you get safe herbal remedies for insects to stay away from your little one. Citronella oil is a strong mosquito repellent and has no harmful effects too. In this post, you will come across some really helpful measures to help your child have a safe fun filled monsoon this year. Any dirt or filth in the neighboring area will always invite insects to your house. Before the onset of monsoon see that you have your drainages cleaned and covered. The municipal authorities need to be informed of any filth to be cleaned in the area near your house. Get the weeds and other unwanted outgrowths removed from your garden. Also, make sure there are no water leakages in the house as dampness invites bacterial growth and the insets. Humid weather is very sweaty and may cause allergies and fungal infections. To check this, you need to bathe your toddler well with soap at least once every day. Also, make sure to apply moisturiser after bath. Make sure to wash the creases of the body well. Special attention needs to be given in washing arm pits, neck, genitalia etc. You may consider adding few drops of Neem oil to your child’s bath as it is a natural cleanser and an insect repellent as well. Herbal mosquito repellents like Citronella oil or herbal creams could be used in the evening hours. You could also apply a little on the exposed areas before sending your child to school. Aloe Vera is also supposed to be a very effective mosquito repellent. These are the measures that need to be taken in order to ensure that your child stays away from mosquitoes and insects. Add a few drops of Citronella oil or eucalyptus oil in the water for sweeping the house. The smell of these oils keeps the insects at bay. You could put some garlic, Neem leaves or lemon in the room as these are effective mosquito repellents. The smell of these natural things acts as a repellent for the insects. Since your child is an easy target, it is necessary to cover the child in the light colored clothes. Dark color clothes attract mosquitoes. It is necessary to use fans where ever you are sitting. Fans help to keep the mosquitoes away. Uncovered dustbins invite a lot of flies and insects. The dustbins should always be covered with a lid. Moreover, the care should be taken that the food needs to be kept covered at all times. Uncovered food may get infected due to flies and mosquitoes sitting all over it. Use mosquito mesh if possible on all the windows and keep the doors closed. It is extremely important to check the entry of these insects into the houses. Usually these insects come out in the evening hours and their entry needs to be banned by taking the necessary measures. These were some of the measures that are necessary to keep the insects at bay during the monsoon. Some of the deadly diseases spread by these insects make it extremely important for you to ensure your child is safe from these pesky insects. The first and foremost basic for doing this remains the hygiene standards. By maintaining good hygiene standards, you would be able to ensure your family’s safety. So, enjoy the monsoon to the fullest and at the same time ensure that you and your family is safe from the diseases that might be caused due to insect bites. My child wants to be carried all the time – What to do?